Stair climbs have become an increasingly popular way to raise awareness and gather support for great causes. Memorial stair climbs pay tribute to fallen first responders. Association climbs are NOT extreme sporting events or fundraising campaigns; instead they are honorable events that pay tribute to the sacrifices of fallen heroes. The first "9/11 Memorial Stair Climb" occurred in Parwan Province, Afghanistan on September 11th 2003 when Albuquerque Fire Department Lieutenant Charles Cogburn scaled a two story building 55 times wearing body armor, a helmet and an M-4. Lt Cogburn returned home and on the following September 11th (2004) the climb was held in the United States for the first time. Given the title Albuquerque Firefighters Memorial Stair Climb, AFD Engine 5 and Engine 2 were dispatched at 8:46am to the Bank of Albuquerque in downtown Albuquerque. The bank building is 22 stories tall and was climbed five times. In 2005 five Denver area firefighters climbed 110 floors in honor of those lost on September 11th at the Denver 9/11 Memorial Stair Climb. Several other climbs joined the Albuquerque and Denver climbs: Sacramento (2009). In 2010 the National Fallen Firefighters Foundation reached out to the founders of the Denver event to develop a protocol to hold similar events across the country. The Nashville 9/11 Memorial Stair Climb was held on September 11th 2010 and was the first to fall under the NFFF. Redwood City (CA) also held it's first event in 2010. In 2011, on the tenth anniversary of the September 11th attacks, over forty climbs were held across the United States. Climb participants honor the first responders (343+ firefighters, 70+ law enforcement officers, 9+ EMS) who were killed on September 11th, 2001 by climbing the equivalent of 110 floors (the height of the former World Trade Center Twin Towers) while carrying the name and picture of one of the fallen. 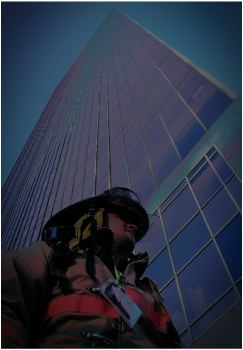 These climbs typically occur in medium- to-high-rise buildings or stadiums and either involve only active duty public safety personnel OR a mix of police, fire EMS and the general public. Some climbs have successfully raised financial support for beneficiaries who provide support to those left behind after a line-of-duty death, while other events wish to remain a memorial event with no fundraising component. Most, if not all climbs, wish to retain local control while receiving the administrative support necessary to hold these events.